I finally got two more applique blocks done this week. 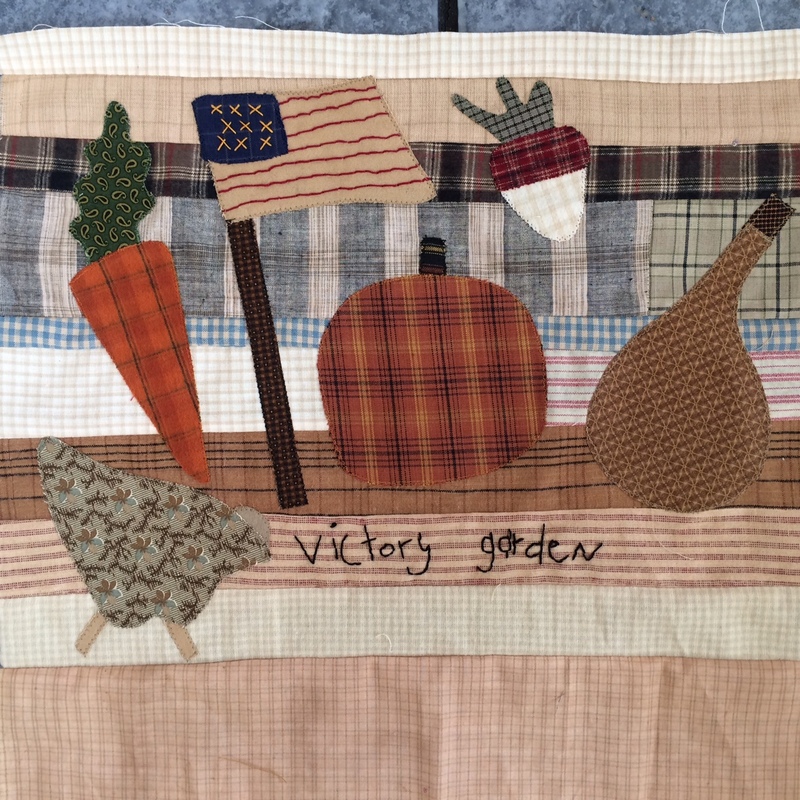 V is for Victory garden. 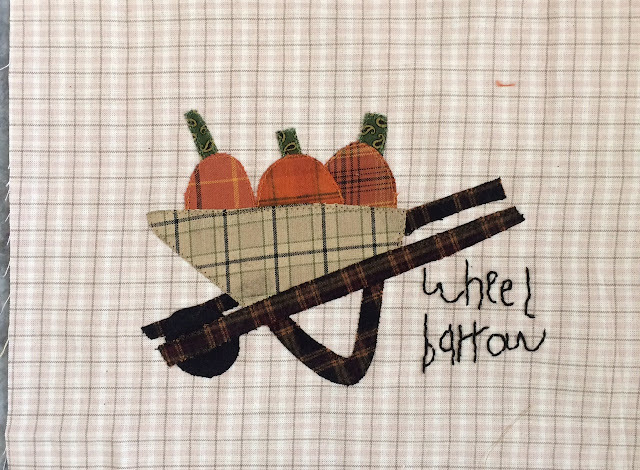 W- Wheelbarrow. In Cheri's pattern it was embroidered, but I thought it would be easier to applique it. I helped my daughter move to a new apartment this week. 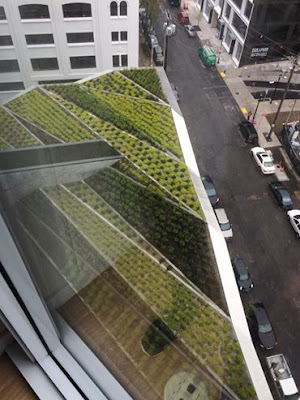 I loved the terraced green roof you can see from her apartment. I'm bringing our Gwennie quilts to the quilt shop today! I'm so excited to see our exhibit! Many of you are in my facebook group so you'll know our local quilters had a show this weekend. Here are some highlights! I love this antique! The tan on the inside and the white squares are unusual and so stunning! My friend has done two of Bonnie's quilts!They were great! I made this quilt and gave it to my friend who made Bonnie's quilts and she opted to enter it. It was Market Day free pattern from Pam Buda. 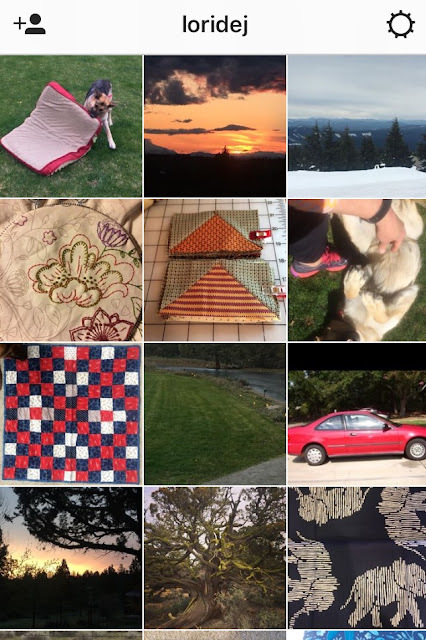 Here are a few more small quilts that Christy entered. 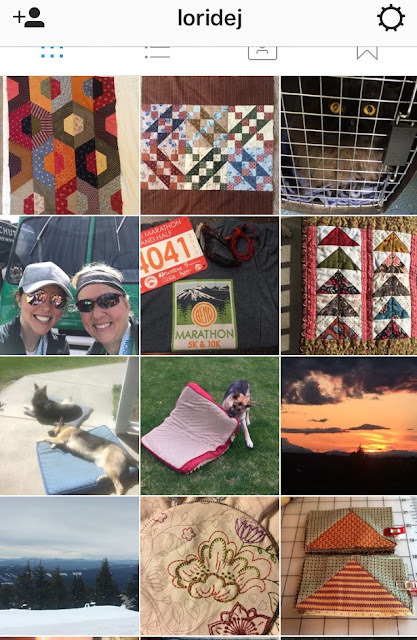 Upper left was Country Roads Humble quilts quiltalong, The one directly below it she made for someone and the lower right is Abundance, another Humble Quilts quiltalong. Thanks Christy for sharing them publicly! Another favorite quilter of mine is Sandy F whose work you see on Anne's Cottons 'n Wool blog. The one above and two below are hers. This was a fun one that caught my eye. And here are the Gwennie Inspired Medallions Quilts hanging. I hadn't planned on showing them but since I had them and I got permission I thought I may as well. I'm waiting for one more then I'll bring them to Bend for the monthly exhibit. They looked great hanging together!! Nice job ladies! but we got my son's car back home. I've been receiving a lovely gift in the mail every month for several months now. Roxanne is going through some similar things with her mom that I went through so we have a common bond in supporting one another. I found this cute little tin in my sewing room that is perfect! For these wee blocks she has been hand piecing. They will finish at 3"! Aren't they precious? Thank you Roxanne! I think of you and your mum often. I've actually been missing my mom lately. I think it is that she loved spring and to see the trees and flowers starting to bloom and this is her her first spring not here for us to enjoy it together. My son sent home a package when he was in Hawaii recently. Last fall when I saw this photo they posted from Vietnam I told them a little piece of fabric wouldn't take much space. They are traveling with backpacks, not suitcases, so every inch of space counts. Jim Thompson. The photo above is a paper envelope that the fabric was inside of. It is so pretty! The elephants panel is linen in indigo and looks like sashiko type stitching. I love it! And here's my Instagram feed for this week. Have a fantastic and thankful weekend! I was recently asked to do a review on THESE clips. 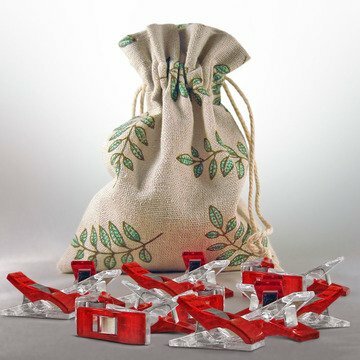 They are very similar to all the other clips on the market, but these come in a cute little bag. They take the place nicely of pins to hold fabric in place while sewing. I was making 49 flying geese- the clips were convenient to hold the parts together in geese of 10. I still need to get the rest of the flying geese trimmed up. They come in a bag of 50 for less then $11.00. I'd say that is a bargain! If you need some click HERE. We have hired a new employee who will be starting in 2 weeks and my son's car that was stolen has been recovered. Hopefully it will drive. I'm heading into Portland to pick it up this week. just think, we are closing in on a finish for this quilt! You can do it!! The linky will be open for a week, so hopefully you can catch up if you are behind. Here's my house and dog. attaching them too as shown in the quilt. Here is Denise's house. She finished her geese last month. Anne was having computer problems so I'm showing her lovely wool block here today. Love it! I'm looking forward to seeing more houses! is the pumpkin and long vine. 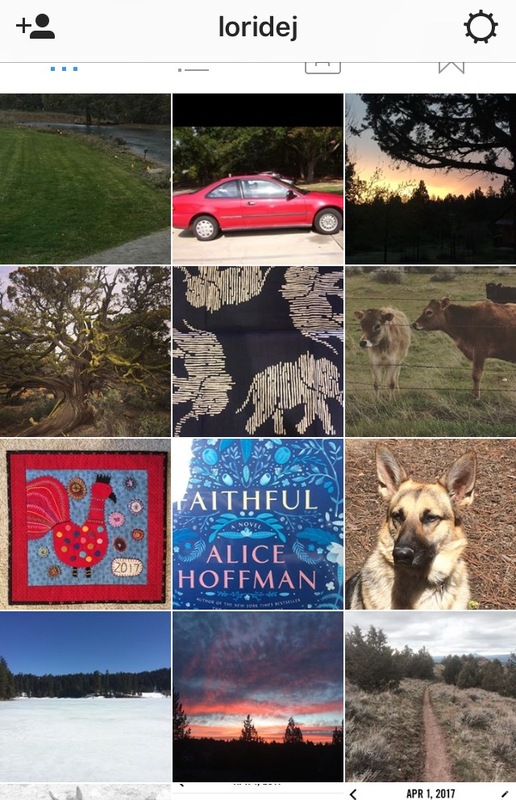 Here is Cathy's block that she has graciously shared with us for an example. I really think we can do this in 2 weeks. Let's meet back here with our completed block on May 1st. Have a wonderful week! If you want to see a little what I've been doing when I'm not sewing look HERE. Little Quilt Swap in High Gear! Elsa was moving in to see what I was doing. Isn't it just wonderful?! My favorite trick to use on current quilts. I don't think Laurie used any batting and I love how it drapes and feels authentically antique! She made this great label but didn't add her name, which I plan on adding. 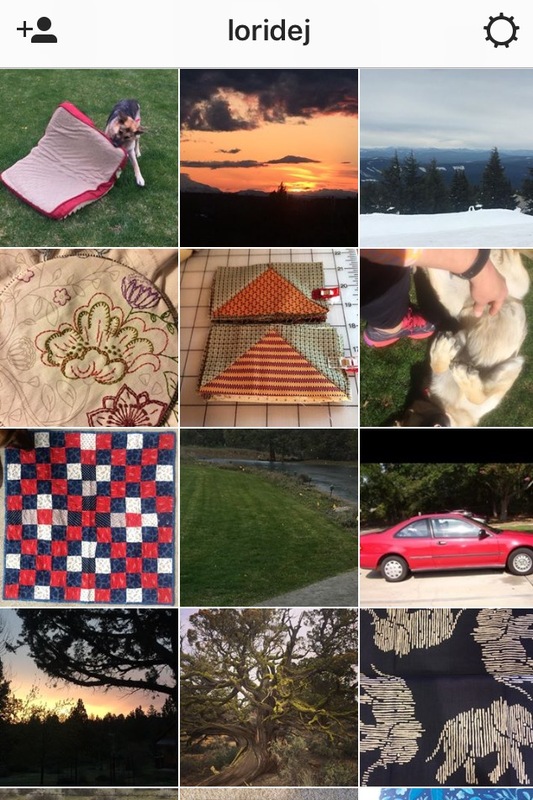 May so all the quilts can be seen in one place. Here's my Instagram for the week. Thank you to those who are sending your quilts for the exhibit. Its going to be fantastic! 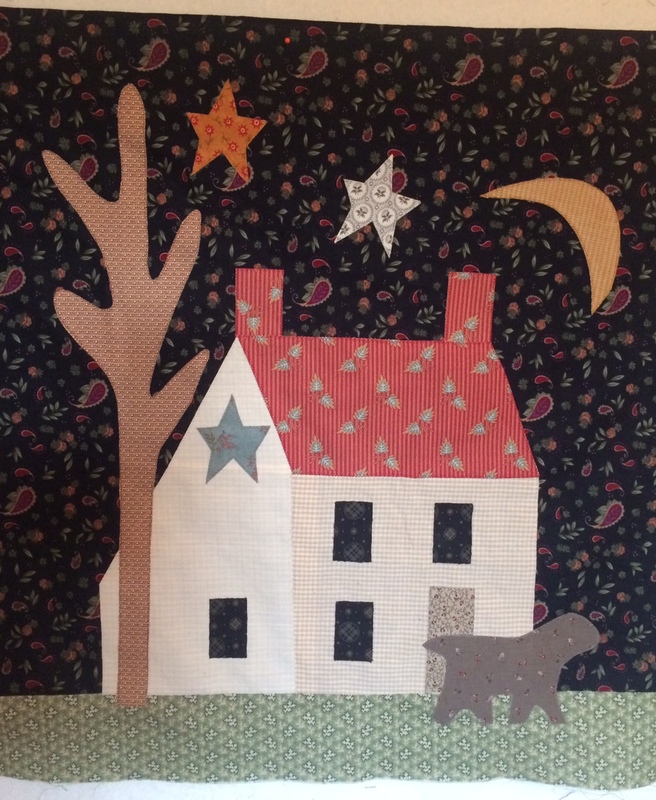 Monday we are sharing the house block and flying geese on our Fall Festival quilt. I guess I better get some sewing on my list for this weekend!! As far as I know I have only one more medallion coming to me. It would be wonderful to have a couple more. I know a few have had to bow out, but originally there was quite a few that said they would like to have their quilt displayed at Quiltworks First Friday and monthly exhibit. I have the quilts out of the boxes spread out on the guest bed. Wow! They are all amazing and always so much better in person! Right now I have 6 quilts and one more is on the way from Juliann. Would anybody else like to commit their Gwennie inspired Medallion quilt to this exhibit in Bend, Oregon? Now would be a great time to write up a quilt description and get your quilt in the mail to me. Beauville on display in Alsace. They were selling scrap bags and I really didn't think I had room for them. Mary Kovall said I must! So I did! This backing is from that bag of Beauville scraps. 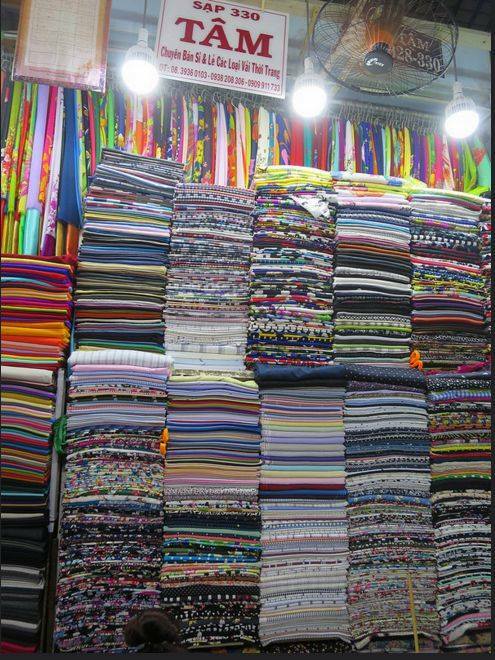 Such a fun memory when I look through these fabrics. Quilts and fabric are so much more than a "blanket" for warmth. Each piece of fabric is associated with a person, place or memory that makes it special. Have a lovely week, dear friends.